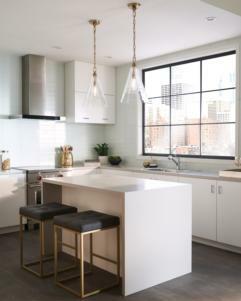 The Elmore pendant collection from Feiss features Clear Candy glass achieved through a multi-step, artisanal process of wrapping small rods of glass around the glass shade to create a textured, vibrant surface that subtly conceals the light source and refracts the light to create a wonderful sparkle. 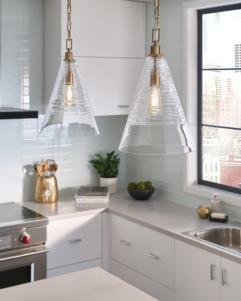 These spectacular, large scale glass shades are available in two classic profiles, a cone or cylinder (both shapes are 18” high), which would easily accent an urban, eclectic loft as well as more traditional, settings looking for rich textures to complement the surrounding décor. Beautiful cast details, like the tailored square link chain in a Chrome or Burnished Brass finish, complete this timeless look, which is versatile enough to work well as entry lighting, dining room lighting, living room lighting, bedroom lighting or kitchen lighting.